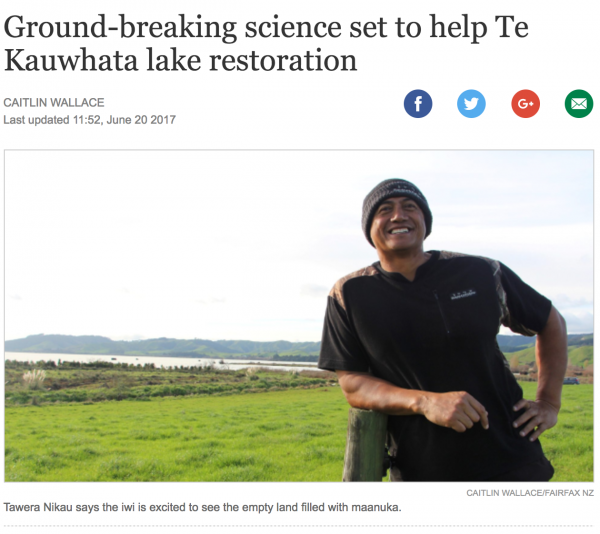 Waikato River Authority funding recipient Stu Muir features in Newshub story on the loss of wetlands in New Zealand. The Waikato River Authority has announced $6 million for river clean-up projects in its just completed funding round, with more than a third of these projects being iwi led. The Waikato River Authority’s eighth funding round has closed with a number of larger projects proposed for river clean-up. The Waikato River Authority has announced funding it will have available for 2018 and signaled a strong desire to continuing working on measuring effectiveness of projects in the year ahead. The launch of a 15-year Restoration Strategy for the Waikato and Waipā river catchments is being seen as a milestone for the future wellbeing of the area. Waikato River Authority Chief Executive Bob Penter interviewed on Radio Waatea on the 2017 funding allocations and some of the challenges facing the Waikato River and Waipaa River. The Waikato River Authority has increased the funding its making available for the restoration and wellbeing of the Waikato and Waipaa river catchments this year to an unprecedented level. The Waikato River Authority’s seventh funding round has closed with $12.5 million being sought for river clean-up projects. It is the Authority’s strongest funding round to date. The Waikato River Authority’s seventh funding round will have up to $6 million available for river clean-up projects this year with applications for grants opening on 3 July. The Waikato River Authority has a new board member with the appointment of Barry Harris. Mr Harris is a Crown appointee through local government nomination. A milestone whole of catchment Report Card for the Waikato and Waipa rivers has been released by the Waikato River Authority giving the catchment an anticipated low rating for its wellbeing. Public meetings and hui for the consultation on the next steps for fresh water are being organised by the Ministry for the Environment. The Waikato River Authority is opening it’s fifth funding round for river clean-up projects from Monday (15 June 2015) with up to $6 million available. A ground-breaking collaboration between dairy industry body DairyNZ, the Waikato River Authority and Waikato Regional Council is lining up to better protect and restore the Waikato River. The Waikato River Authority has announced it will allocate $6 million to 33 river clean up projects this year following its latest funding decisions. The Waikato River Authority has received 52 applications to fund river clean-up projects totalling $17.2 million in its fourth funding round. A strategic Waikato River catchment leadership group has been established to chart new territory in the way industry, government and iwi organisations can work together for the benefit of the Waikato and Waipa rivers. A dairy farming operation that borders the Waipa River for two kilometres near Otorohanga has won a catchment improvement award sponsored by the Waikato River Authority. The Waikato River Authority is bringing forward and adding a million dollars to it’s funding round this year in an effort to get increased momentum in cleaning up the Waikato River. 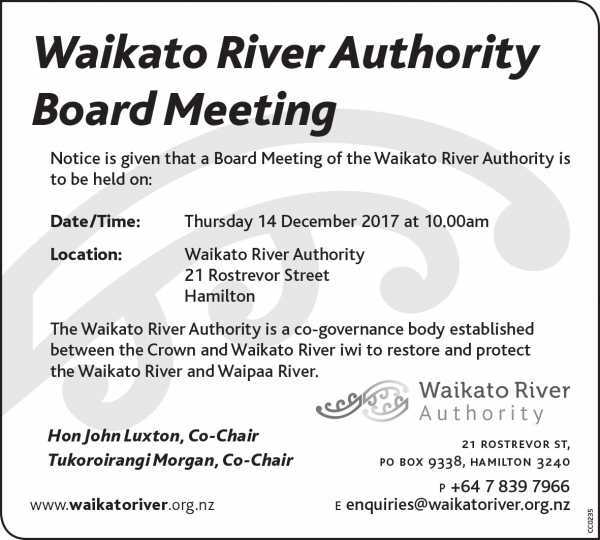 Two of the Crown representatives to the Waikato River Authority have been reappointed to stay on the Authority for a further three years. The Waikato River Authority’s second funding round just announced has a focus on whitebait habitat restoration and engaging young people on river clean-up projects. 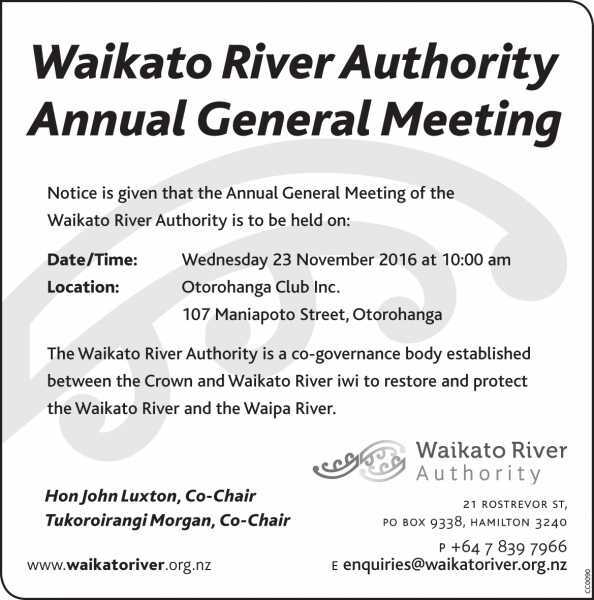 The Waikato River Authority held its 2nd Annual General Meeting in Hamilton on the 8 November 2012. The Authority’s 2012 Annual Report was tabled at the meeting. The Waikato River Authority’s second funding round has closed with more than $10 million dollars in eligible applications for clean-up projects. Applications closed on Friday 2 November. There were a total of 60 applications seeking $10.4 million. The Waikato River Authority’s second funding round, which has been open for applications for more than a month, closes next Friday (2 November). The Waikato River Authority’s second funding round opens for applications from Monday 24 September with $6 million again available for river clean-­up projects. A former dairy industry water and sustainability policy manager is to carry out the role of funding manager for the Waikato River Authority. We are seeking Expressions of Interest from suitably qualified people to become part of an Evaluation Panel to assess applications received by the Waikato River Clean-Up Trust. The Waikato River Authority will be refreshing its approach to how, and what sorts of river clean-up projects are supported, when it opens its second round of funding. Preparations are underway for a start on one of the major projects to be funded by the Waikato River Authority in its first funding round. The Waikato River Authority has announced its funding decisions for major projects as part of the inaugural funding round for the restoration of the health and wellbeing of the Waikato River. The Waikato River Authority has approved the first funding applications of itsinaugural funding round, with decisions having been made on projects seekingfunding of under $50,000. Applications for Waikato River clean-up projects closed at the end of last year. The deadline for the first round of funding applications for projects that cleanup the Waikato River will close shortly. The Waikato River Authority is receiving applications up until the 16th of December. The Waikato River Authority (WRA) and Waikato Regional Council have today signed a new partnership agreement on how they will work together on cleaning up the Waikato River. The Waikato River Authority, a co-governance body established between the Crown and Waikato River Iwi to restore the Waikato River, is keen to work with groups that may be considering applying for funding for river projects. The Waikato River Authority, a co-governance body established between the Crown and Waikato River Iwi to restore the Waikato River, reaches an historic milestone today when it opens for funding applications for the first time. The Waikato River Clean-Up Trust says it will be calling for its first funding applications for Waikato River clean-up projects from 1 October.